Just sent away Thanksgiving Day, the Christmas Day is coming! Wish you an happy holiday! Wish you a healthy 2008! 6. What's the next on our website? Some friends asked "Why should we eat different foods in different seasons?". " Why our organs show strength or weakness in different seasons?" Both western medicine and traditional chinese medicine think human has close relationship with nature and social environment. In which the nature environment includes seasonal changes,day and night changes and geography changes,etc. They affect us on physiology, pathology, diagnosis, treatment,etc. Our body echo these nature changes, our various organs show strength and weakness accordingly and orderly. Traditional chinese medicine calls this medical time. In the meantime, different foods act on different organs. If we conform to this body's biological clock law, learning the exact moment of strength and weakness, learning food function to us,then we can adjust our body to a balanced status. Below is traditional chinese medicine's human daily biological clock. From the above, we know the reason why so many heart stroke happened in midnight(because our heart is weak at that time),and why some patients don't cough at day time but do at night. Seven O'clock in the morning is the best time for our breakfast as our stomach is active most and so the food is easy to be digested at that time. The 11th month is from December 10th to Janary 7th, 2008.
avoid salty foods intake such as kelp,Laver, jellyfish, sea cucumbers,etc. (Protect kidney). This will protect heart and lung, prevent kidney from too active. 1. Clean pork rib in hot water, or put pork rib in boiling water and quickly take out. 2. Add pork rib in a saucepan, add water, cover,about 2 times of meat.Add sallion,ginger, anise star,soy sauce. 4. While cooking pork rib, clean bitter melon,remove seed and the white part. Marinate in salt water for 10mins. Quick-boil in boiling water,take out,set aside. 5. When the pork rib is cooked, add bitter melon, add salt, continue to cook for 10mins. Turn off heat,serve. Note: If you like to eat bitter flavor, then you don't need to marinate or quick-boil bitter melon. This dish is suitable for those who are easy to get hot. It's a good dish used to remove heat in summer. Those who are afraid of coldness(like me) shouldn't eat. 1. Rub 1/2 teaspoon salt on the fillets,marinate 10mins. 2. Add 1 tablespoon olive oil in a oven-proof saute pan. Add fillets,pan fry one side for 4mins. Flip over carefully,pan fry the other side. 3. Sprinkle 1 tablespoon onion and the pepper on the fillet,put in the oven(preheat to 450 degrees F),cook 5-8mins. 4. While cooking fillet in the oven,heat the saucepan,add sugar,cook until melt.Add pecan,stir well,make sure sugar well coated,pour out to a dish. 5. Heat the rest olive oil in the saucepan,add onion,stir. Add pecan, celery,stir fry 2mins. Add the rest salt,stir. Add tomato sauce,stir fry 2mins.Turn off heat,set aside. 6. Arrange the fillets,each on a plate. Pour on the above pecan vegetables.Serve. Serve as main dish at lunch. Beneficial Function: Help to reduce blood lipid and cholesterol,increase brain function. 1. Brew green tea with boiled water(about 80 degrees C). Two steps: 1st,add tea in a cup,add water,pour out the soup. 2nd,add water again(about100ml),cover for 20mins. Remove dregs,leave soup. 2. Clean rice,add in a rice cooker,add tea soup,the rest water,cook about 30mins over low heat. 3. Add sugar,stir well,turn off heat,serve. Serving Method: Serve as main food at breakfast. Beneficial Function: Suitable for those who are with diarrhea, enteritis, gastroenteritis,etc. Note: Those who are sensitive to tea or insomnia don't eat. Almond jelly is a famous chinese snack in summer. Since it looks like tofu,so we call it Almond Tofu,but there is no tofu at all in it! The reason I introduce it to you here is because it's Christmas holiday and there are lots of big meals during holiday. You'll feel very comfortable to eat it after a big meal. 1. Add water in a cooker,add jelly powder(pour in while stir),bring to a boil. 2. Meanwhile add almond powder,milk,sugar in another cooker. Bring to a boil. 3. Add the above 2(almond milk soup) in the above 1(still boiling). 4. Continue to cook 5mins. Turn off heat,pour in a big bowl. 5. Cool,put in the fridge for 2-3 hours, or until totally become solid. 6. Take out,cut into small cubes,add some fruit cubes,such as apple,pear,mango,pineapple,etc.If you like sweet tast,serve with honey,rose sugar,or sugar sweet-scented osmanthus,etc. *Note: If you don't know where to buy almond powder,then you may make by yourself. Two methods: one is grinding into powder directly from almond(remove peel). Another method is,soak peeled almond in water,add in a juicer,making into almond juice. Bebeficial Function: Moisten lung,help to reliev a cough,good to our skin.Some experiments show that almond helps to reduce cholesterol,prevent coronary heart disease,defecation. Add water in a cooker, add brown sugar and ginger flakes,cook 10mins. Serve with warm before go to sleep. This recipe is only suitable for those whose cold is really caused by coldness and chilliness. And those who always feel hot should be careful when serve it. End of October,it's a little bit cold in Shanghai. One of my friends got cold. She ate some Brown sugar with Ginger soup. I asked her whether her cold was caused by coldness as it was still warm outside. But she didn't pay attention my alert. On the second day, her face got lots of red pimples. Several days later,she saw a tradition chinese medicine doctor. The doctor said her liver fire was high and wrote a subscription for her. She got well after eating the doctor's recipe. One day last month,we got the coldest day this year. Mom felt uncomfortable. She said she might got cold as she didn't sware her cap and was blewed by the cold wind in the morning. I made her Brown Sugar with Ginger Soup at night,and asked her to drink some. On the second day Mom got well, but she got a pimple on her face. I joked at her"Mom,you went back to 20 years old". (Only young people get pimple, whelk,etc. Mom is already more than 60.) I know why Mom got a pimple. She has too strong Yang in her liver(liver fire is high). After drunk ginger soup,her liver fire came out and so got pimple. But her cold was really caused by coldness and so she got well after drinking ginger soup. In holidays,if you don't go for a travel lots of big meals are waiting for you.Inevitably, you may feel greasy. In last newsletter(10th month), I introduced two recipes that can protect your stomach and fresh your taste. In this issue, I'll introduce another vegetable recipe that will fresh your taste. 1.Put tofu in the fridge at the previous night. On the 2nd day,take out,put in warm water,let it melt slowly. (about 2hours). Using fresh tofu is also taste. 2. Clean chinese cabbage,cut into bite-size pieces. Clean black fungus,split into small pieces. Clean carrot,cut into small flakes. 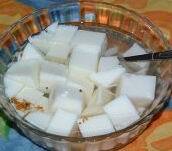 Drain well tofu,cut into small cubes. 3. Heat olive oil in a wok,add shallot,add five spices powder,sway the wok make sure shallot and five speces powder mixed in oil.Fragrance comes out at this moment. 4. In the following order,add carrot,black fungus,chinese cabbage,soy sauce,stir several times. 5. Add tofu,broth.Carefully flip over,make sure not always on the top. 6. Cover,cook 10 mins over medium heat. 7. Add salt,garlic,stir well. Stir fry 5mins. Cover and simmer additonal 5mins,or until all the stuff thoroughly cooked.Serve. If you have waterless cookware, then just put all the materials in the saucepan,add 1/4 broth,(don't need cooking oil)cover,turn on the heat,wait for the whistle. Turn off heat. Add salt and garlic to taste. Beneficial Function: Clear heat, diuresis, detoxification, remove fat, relieve food stagnation. 2. I've recorded the procedure of making Jiaozi and Baozi(steamed stuffed bun). It's the good food to be showed off in your holiday party. I'll try my best to publish the video asap. Enjoy your Christmas Day! Hope you won't gain weight after enjoy your big meal!